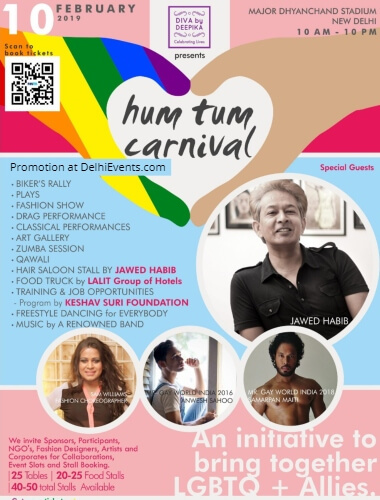 The Concept Commemorating the victory of Section 377 verdict, Hum Tum is an attempt ..
1)To create awareness of the challenges faced within the LGBTQIA+ community and provide exciting opportunity for them to share their talent with the society. Through this colourful event, we hope to bridge the gap between the LGBTQIA+ community and rest of the society. 2) Discussion for employment opportunities for Transgender and other sections of LGBQIA+ community . 3) Spreading awareness for HIV, its prevention and better health through HIV awareness and prevention campaign. We would also be having an HIV testing Van, Doctors and Councellers on board. This event also promotes culture and art,. It will be a fun filled day full of activities at night which includes promotional goods and food stalls, Art Gallery, fashion Show. We also have dances, poetry, Zumba, plays, Talent Hunt, Drag performances, Kawalli and Rock show at night. Few famous performers are Kashif Nizami, Divya Dureja, Rotten Guitar,Singer Sonu Sli ,Uddhav Kathak group, Hiten Noonwaal and many more..